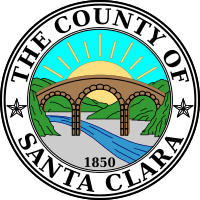 Santa Clara County, officially the County of Santa Clara, is a county in the San Francisco Bay Area in state of California, United States. As of the 2010 census, the population was 1,781,642. It is sixth largest county in the state of California by population. The county seat and largest city is San Jose. ↑ "State & County QuickFacts". United States Census Bureau. Retrieved Mar 25, 2016. This page was last changed on 14 August 2018, at 20:14.